Trustnetwork24 Review 2019: Is Trustnetwork24 a Good Hosting? I signed up to Trustnetwork24, reviewed their unique features, tested how easy they are to use, checked with support on several issues, and tested the speed of the live site. When done, I tried to cancel my account and receive a refund. This is my experience with Trustnetwork24 - I hope you can learn from it. 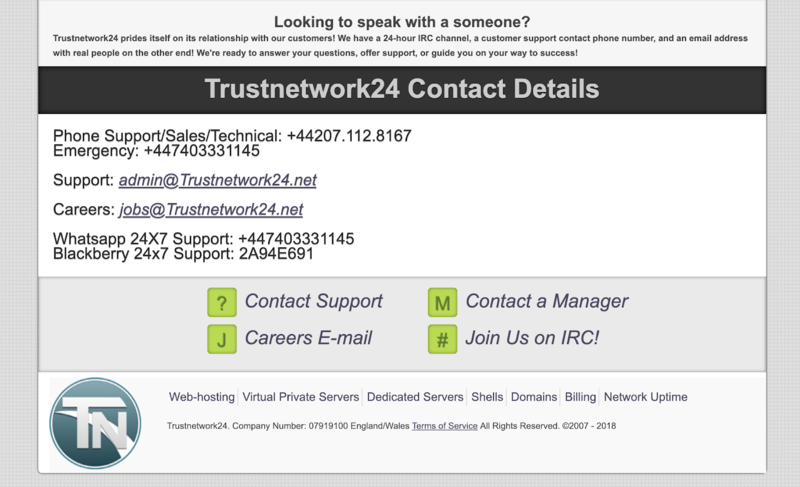 Trustnetwork24 is a U.K.-based web hosting company that’s been offering their services since 2006. They also offer virtual private servers and dedicated hosting for webmasters running larger websites. Support is available in U.K. English. Trustnetwork24’s most standout feature is that though their staff and support personnel are in the U.K., their servers are in the United States with locations in Los Angeles, Chicago, Miami, and Dallas. For European webmasters with a lot of traffic in the U.S., this gives them the ability to have their traffic routed through a data center in close proximity to all corners of the American market. Trustnetwork24 also offers a 99.9% uptime guarantee on all of their shared hosting and VPS plans. Although none of their plans come with SSL certificates, webmasters can benefit from both the Softaculous and Fantastico auto-installers, which offer integrations with hundreds of popular applications including WordPress, Joomla, and Magento. All shared hosting accounts are hosted on Linux setups, and cPanel is available for webmasters to install, configure, and manage the various aspects of their hosting. If the pre-made shared hosting and VPS plans aren’t enough to fit your needs, you can also get a customized configuration through a dedicated server plan. Unfortunately, there’s no mention of the MySQL/PHP versions available, nor does the host indicate the number of websites and IP addresses supported on each web hosting plan. If you’re getting hosting for a business website, I’d recommend checking on the software versions before you move ahead with the purchase as this will have a significant impact on the security and website loading speeds you’ll have. On top of that, their checkout process was rather confusing. You’ll need to have your domain already purchased prior to getting hosting from them, as they seem to assume you already have a domain during the checkout process. Domain registration does not come included with hosting. A key standout feature for Trustnetwork24 is the extremely low price point they offer for servers based in the United States. Despite offering complete U.S. geographic coverage along with U.K.-based support for European customers, the price is lower than what you’ll pay for similar performance thresholds elsewhere. There are three pricing plans available for shared hosting. The lowest-tier plan offers 600MB of disk space and 1GB of bandwidth. But the real value is in the price-to-performance ratio; the highest-tier plan offers unlimited disk space and bandwidth, but costs less than twice the entry-level plan. Given the low absolute cost of the plans, it’s unclear why you would want to purchase the entry-level option, but it’s available if you’re on a tight budget. In addition, very small discounts are offered for longer-term commitments on either a quarterly, semi-annual, or yearly basis, but the amounts are so insignificant that they aren’t really worth locking yourself in. Support options are poor. There’s supposedly a live chat option, but it was not online during the business hours listed. In addition, I called the emergency phone support and received an automated response from the phone company stating the number did not work, and no one picked up the basic support number. There’s also an email address listed, but I did not receive a response. Trustnetwork24 offers full U.S. geographic coverage with unlimited bandwidth and disk space for a very competitive price. With 99.9% uptime, Softaculous integrations, advanced programming languages and the ability to add DDoS protection, it’s worth considering — provided you don’t mind the lackluster support. Wondering how Trustnetwork24 stacks up against other Web Hosting companies? Enter any other Web Hosting company and we will give you a side-by-side comparison.